The design is super sleek, in the frosted finish it looks more like something Porsche Design would make than a mod maker from Malaysia. Some like the aesthetic and others don’t, we like minimal clean design so it speaks to us. The compact size contributes to great flavour, but it also makes it look great on many mods. Be it a simple design, there is however a lot of great thinking going on. The tolerances are all spot on, everything clicks into place and stays there. We always like top airflow for it’s flavour qualities and cleaner vape, they make less of a mess and are more forgiving on over dripping. At first glance you would expect a rowdy, hot vape, but surprisingly it’s not. 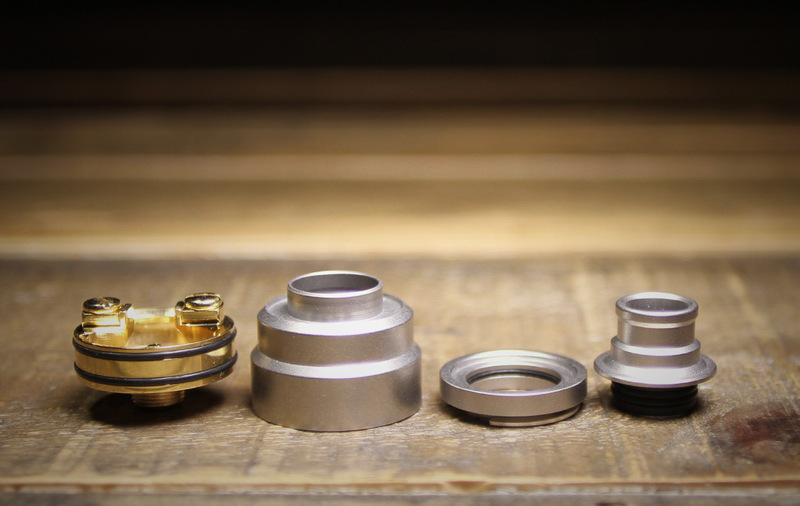 The integrated drip tip has great mouth feel and even the metal tip has a delrin insert that keeps heat somewhat under control. Inside you’ll find mirror finished gold plating that adds a pop and helps with conductivity. The two post clamp design deck works well, we have had some good luck with temp control. Really there are very few cons to the Typhon. Flavour is very very good. This had to be one of the shortest profile top airflow rdas around. We aren’t sure if it creates a typhoon inside, but it is a wonderful volume of vapor with crisp flavour. 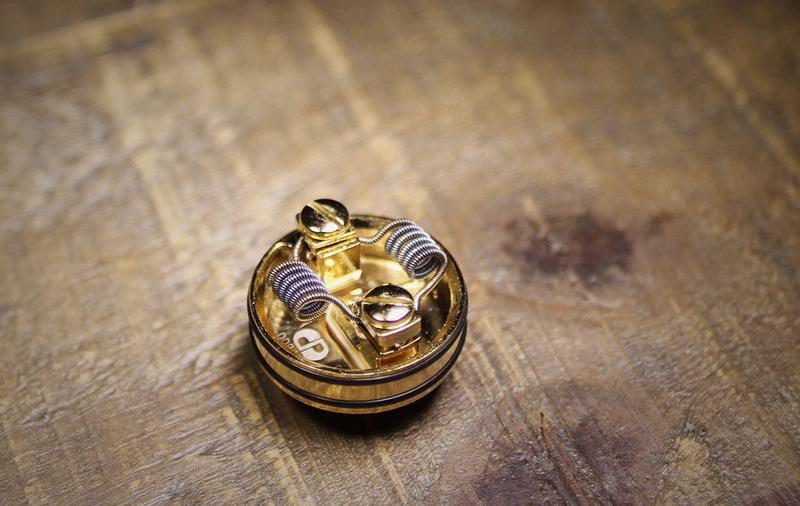 As with all top airflow attys, getting your coils as close to the airflow is key. 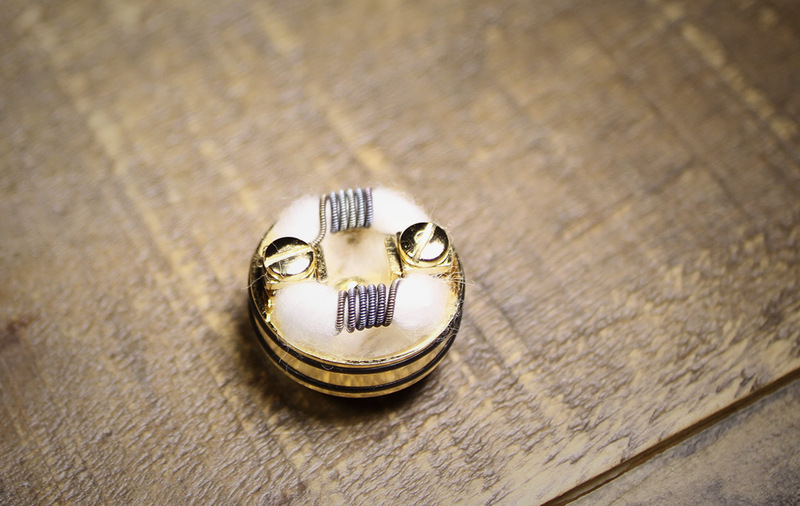 Aligning your coils with the top of the post screws does the trick. Airflow is simple yet pretty ingenious. Similar to the Aeolus it has a twisting AFC that opens or closes a series of airflow holes/inlets. It’s hidden which helps in keeping with the clean aesthetic. Adjustments are made easier with the top cap off and a visual from the under side. There are between fours settings to choose from. We prefer it half open (2 holes a side) for a nice restricted lung hit. It’s a smooth, swoosh draw that can be drawn out for long flavourful hauls. Again the o-ring tolerances are prefect, once it’s set the AFC keeps put. 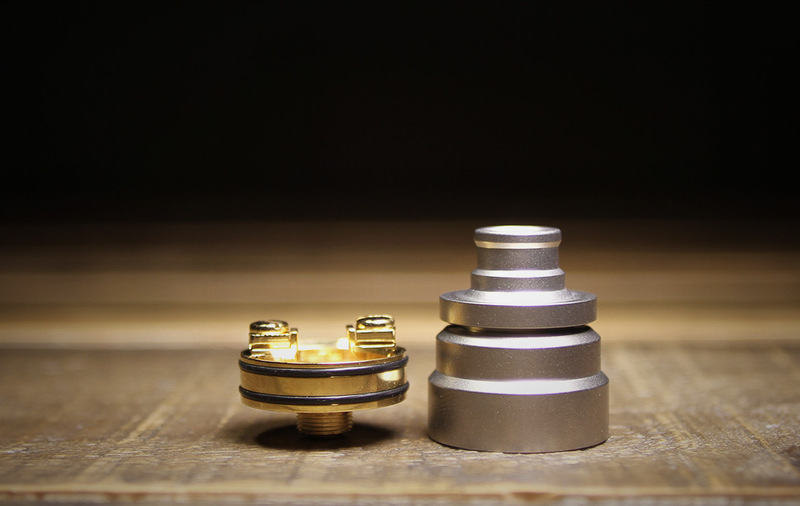 Building this atty isn’t super hard, but not crazy easy either. While the clamps are beveled, we find getting 4 wire leads into the slots closest to the centre a bit challenging. We end up placing leads on either side of the screws, this makes the build more challenging. 28awg is sure to be fine, anything thicker you need to think about either side of the screws as described. Our favourite build (not pictured) has been a Dual, 26awg, SS316, 7 wrap, spaced, 2.5mm, ohming in at 0.25-0.3 run at 40-45W (around 3.8V). It’s a warmer, flavourful vape with slight issue of heating up the metal drip tip when chain vaping (nothing too bad). Juice Capacity is outstanding for the size really. We can easily fit 20+ drops without an ounce of gurgle and get a good 12+ long hauls before starting to run dry. Mind you we also have our wick leads just hitting the deck. 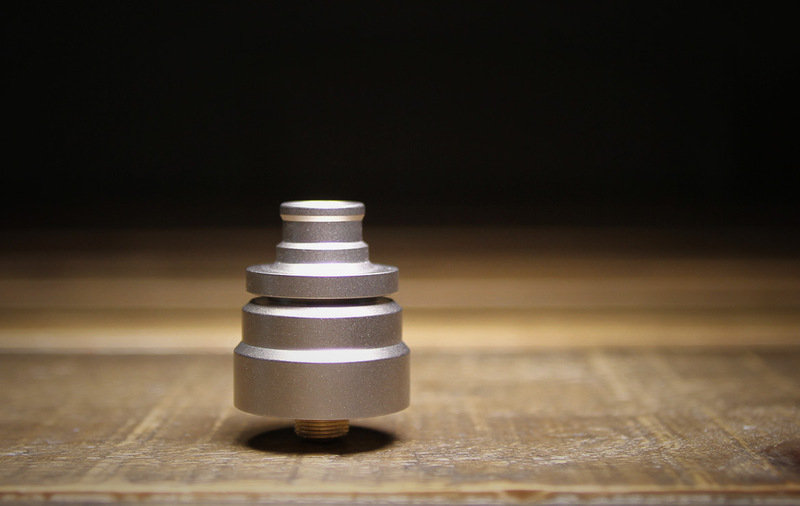 We love that you can drip down the drip tip and keep things nice and clean (it’s not a crazy wide bore though). The DDP Typhoon has a lot going for it, sure the authentic is pretty pricey and a hard to get, but this is one atty you can skip right to the authentic for. We understand not everyone can afford high end attys and this clone is very good, but if you find the real deal go ahead and grab it, you’ll love it. This atty deserves to be mentioned as one of the best of 2016 (sorry we didn’t get to it till now). Try the clone, if you love it, buy the authentic. Finally have a review on this Atty from u guys, yours review was always reliable! Can’t wait for your review for the O-genny rdta. U can use single coil by adjust post pin and move postitive post around 90°, for sure search typhon build on google. I use it and flavour more good, setup on kanthal 22awg dim 2,5 5 wraps on 0.3 ohm runs very well for me, flavour incredible.